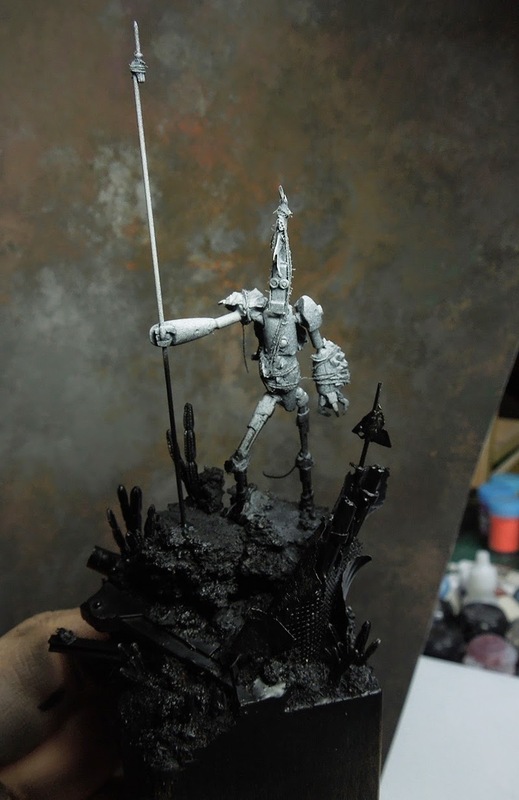 during the last tutorial voting you decided to see this robot come to life and colour. Maybe one day, during MV's year of the painter we will see the pirate win, maybe. This said I want to tell you my thoughts I made during the progress of "The First One". 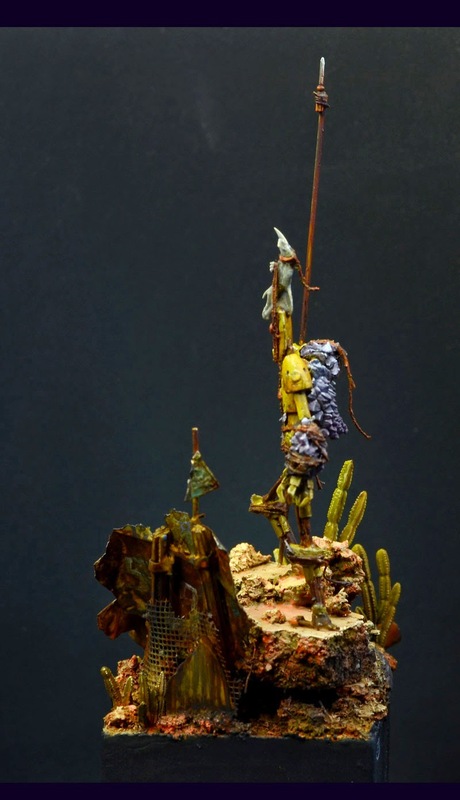 Tell you how he grew, tell you how I based and painted it and tell you some hints and tips here and there for your work on this kit. I hope this article helps you additional to get in the right mood for working on your own entry for this one of a kind contest. Remember you can win this - exactly this robot from this article - as one of the cool prizes in the contest. I hope you enjoy and if you do, consider a little support via a jungle donation for the time I spent sitting here and preparing all that you can read now. Click here to support! 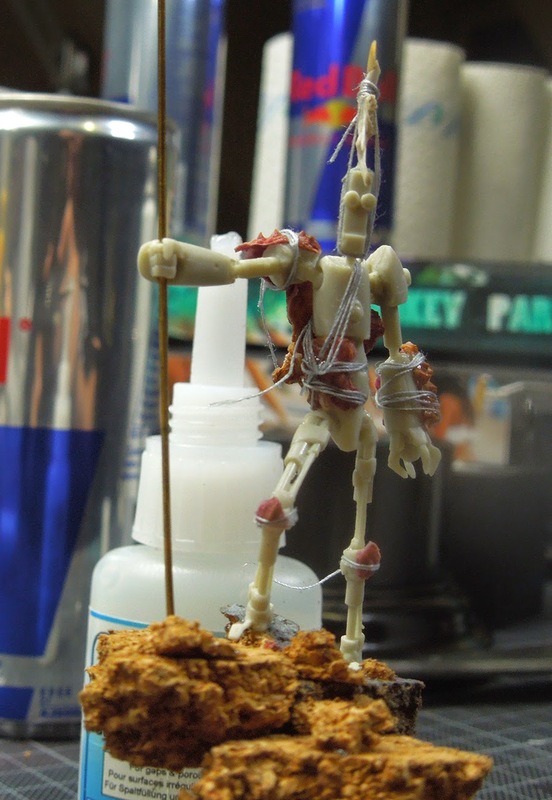 The robot was sculpted by Antonio Fernández, our monkeyfriend from Cursed Monkeys and is a model sold by Heroes & Villians. My first impression when I saw that kit was a simple "YEAAAHHAAWWRR!!". An unbelievable number of options with cool parts here, so much creativity to be enjoyed and so much character in the different robots you can build with it. Very cool! But, while unpacking it at home this cool first impression melted into confusion. Where is the plan to build the robot up I want? 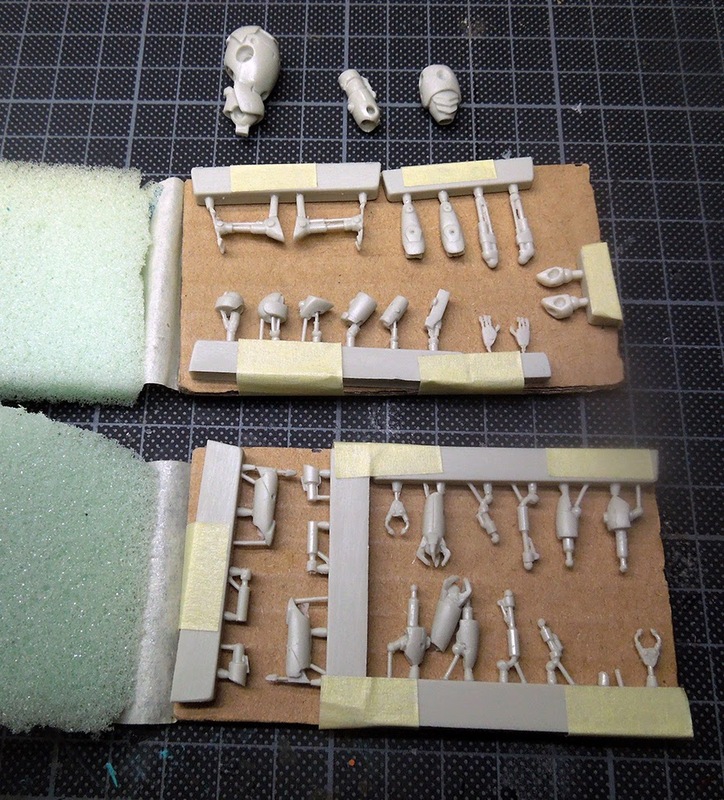 I got so many parts and I am having troubles realizing at first which part is meant to be what. Brain goulash at first. 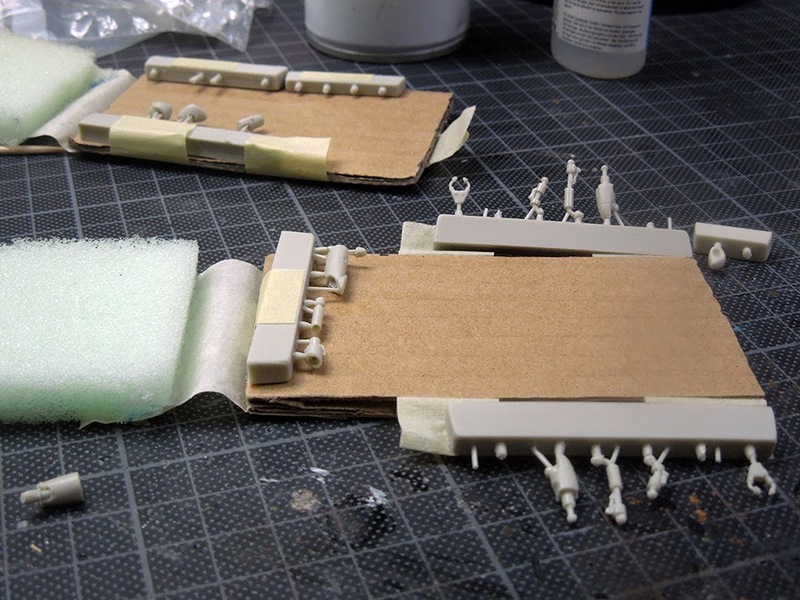 What I learned: Take your time and look at the parts as they are still stuck to the resin. 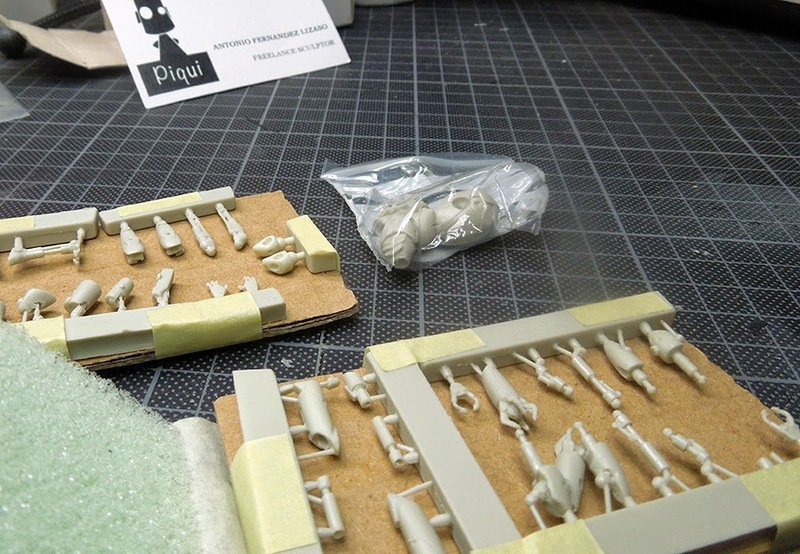 Think yourself into the kit, before wildly cutting parts out of it without knowing what you want to do with them. To improve the kit I would a little guide on paper, but maybe this would already block creativity, who knows. Take care too about your cutting work, some parts are really thin and are easy to break. Been there, done that. After I decided for my parts I could not resist to clean them properly, which was not big work. I wanted to reach the point when it comes to glueing soon. 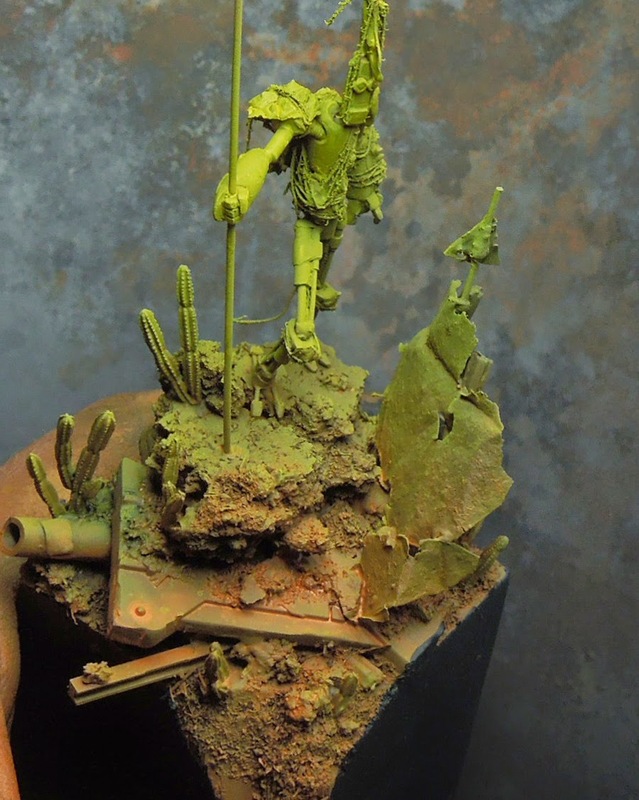 Again take care with thin and fine parts while cleaning the miniature. They can easily break. 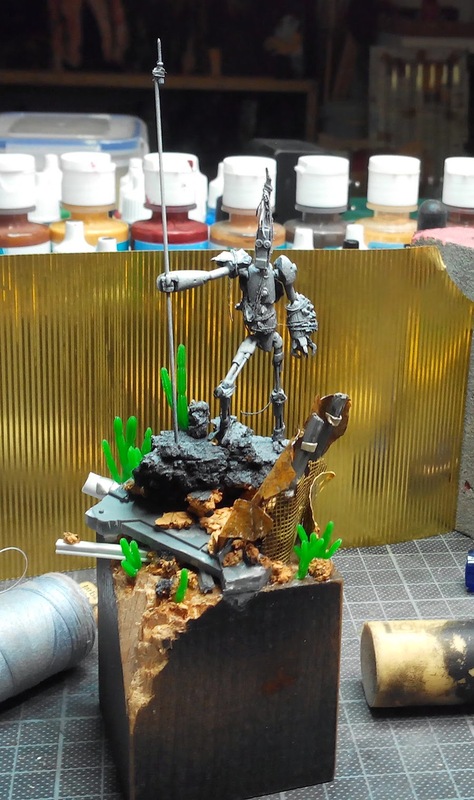 The choice of parts I made looked like this and I decided to see the robot in a more "historical" pose. 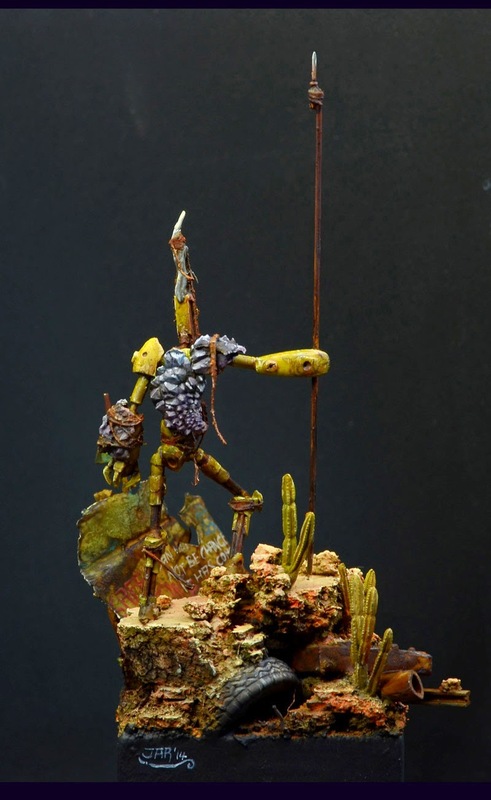 With a spear made from wire, a little heroic pose. 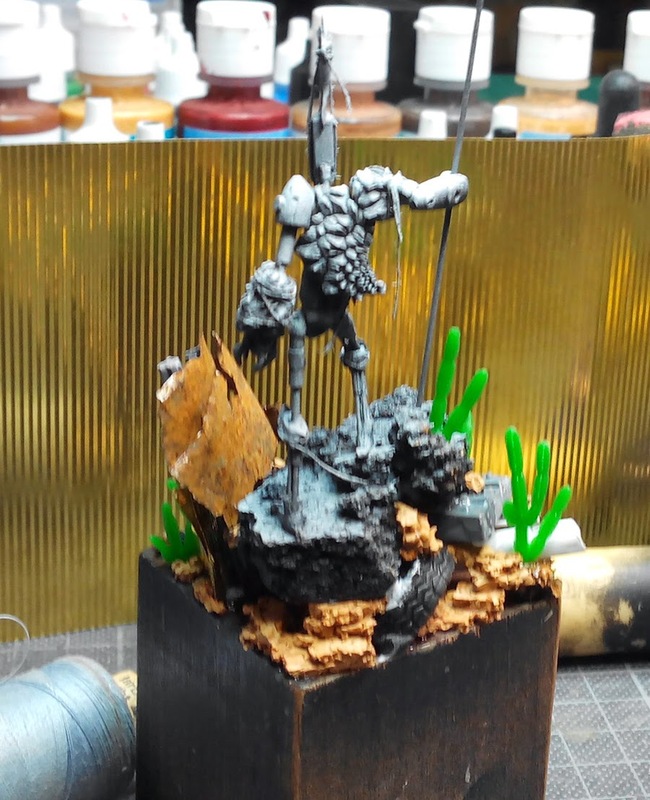 To support the pose I used some cork for structure. Here he is... the birth of "The First One"
I knew in the beginning that I was up to convert that robot a little bit. 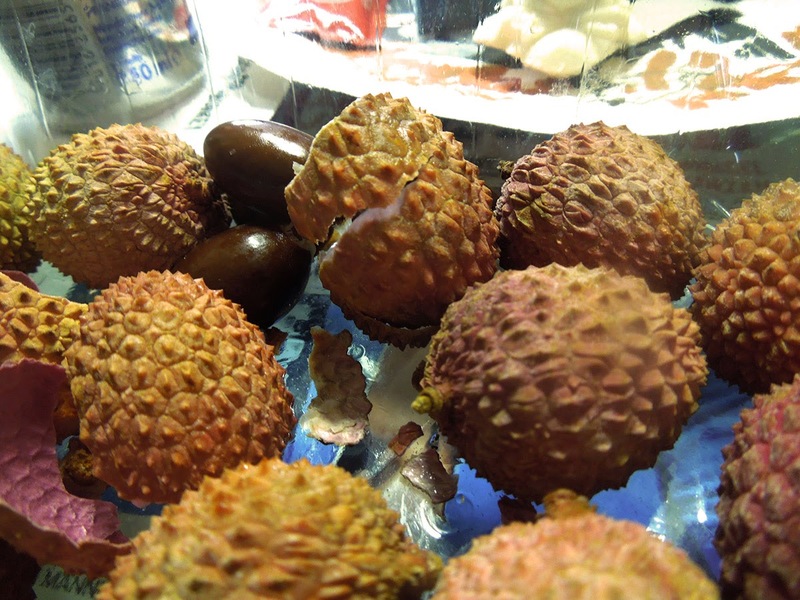 Sanne, our trainee brought lychees that day and as we sat and ate we were so fascinated by the structure of lychees. I decided to use parts of it as "dragon/monster-skin" while Raffa did his cool Lychee-Priest. I used thin string and superglue to bring the Lychee parts I wanted to use in place. I checked them for the right structure, for the areas on them that convinced me most to look like that skin I was aiming for. In the end it is still fantasy so need to worry to big here, but little thoughts are always good. 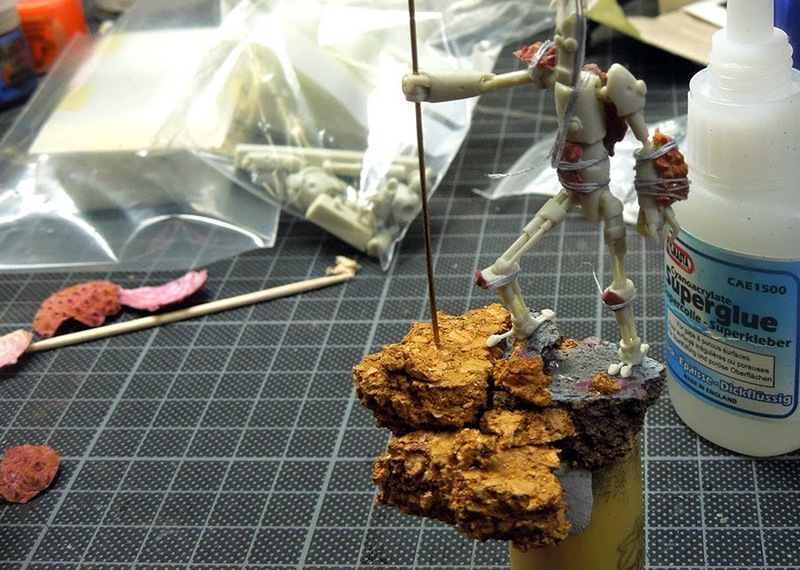 Using more cork for basing I placed some more parts on the base. The decision for the spears time was found in a 1:35 screwdriver, which was again attached with string. Another element, a piece of a mouse cheekbone was also placed to show another element of those monsters. Woot? Working with real bones? Check this article. 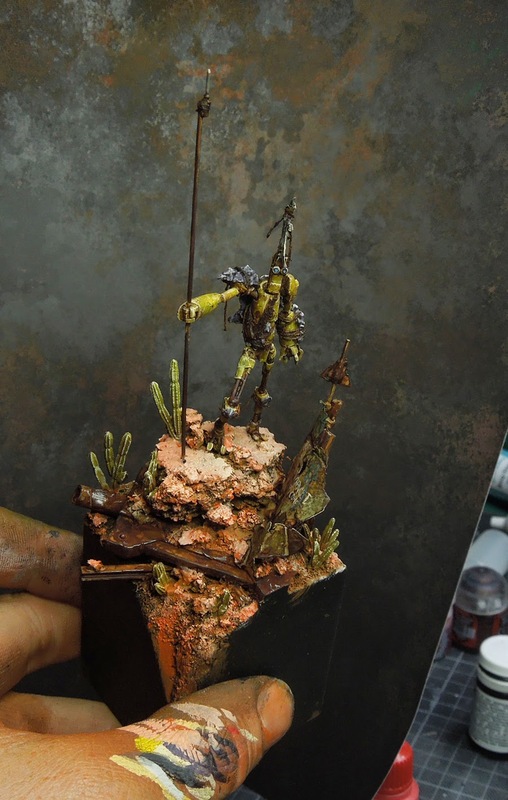 In the beginning I was really convinced to use that simple base somehow, but this changed for good. Well, but I did no paint him asap. Why? 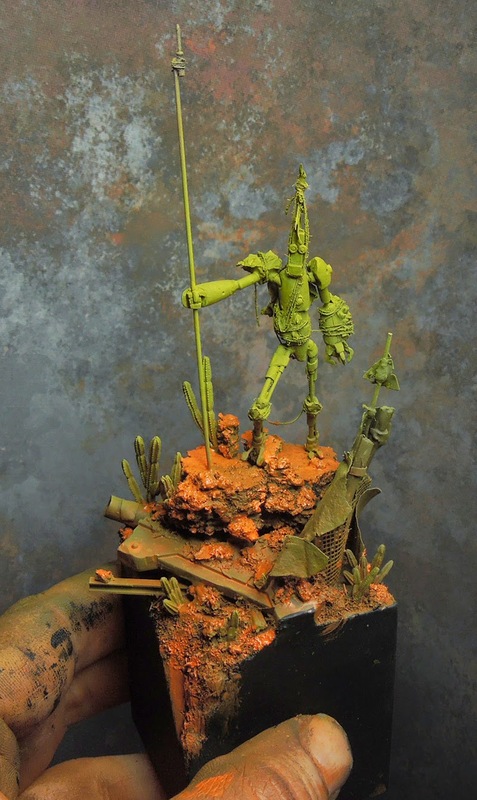 ... bu ... bu ... but Roman, the figure is primed already and the base is not? What the heck are you up to? Well, I asked myself the same question and just skipped further thoughts on this. 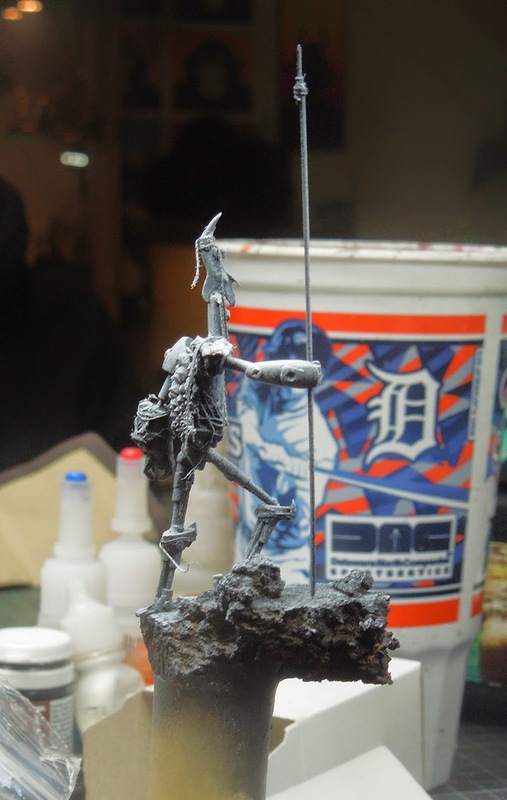 I used a good angle to spray the base just black without touching the figure too much. My mind free and music was good. I just decided to hit it without further plans. 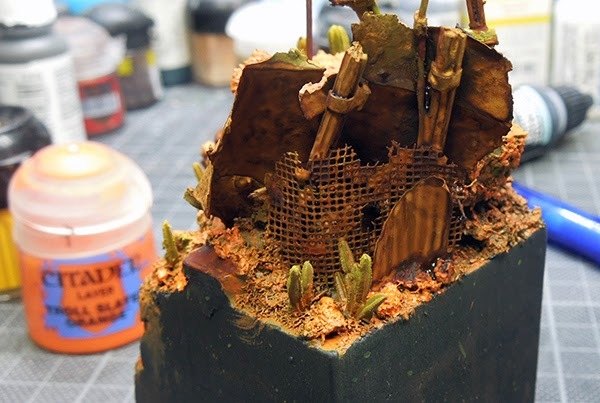 I knew by the use of the cacti that the base would be some kind of desertlike and that the robot will have rusty areas. 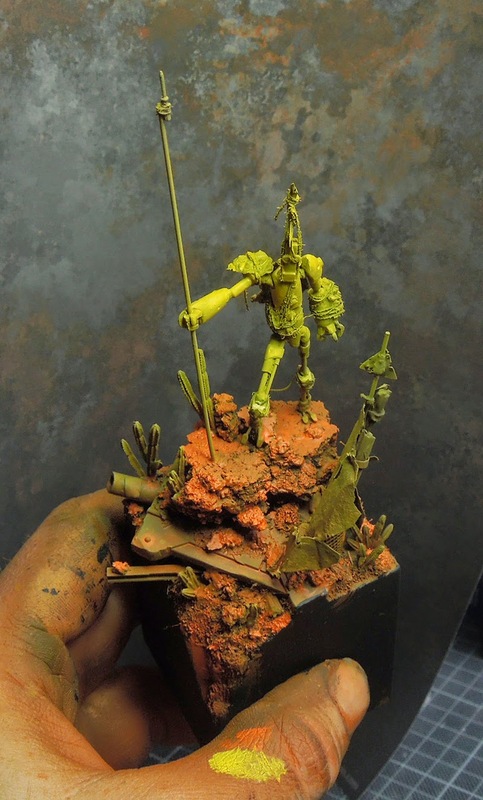 I decided for some brown base colour applyment with my airbrush to the figure itself and with some brown/orange to the base ... POW! 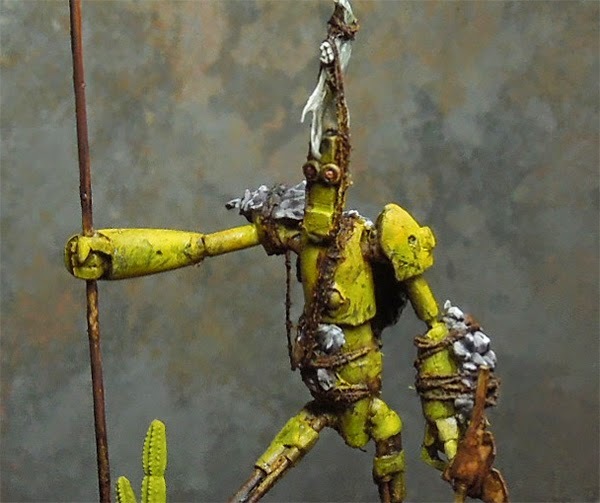 Without further hesitation my brain and heart told me that I would be happy painting a kind of yellowish robot. 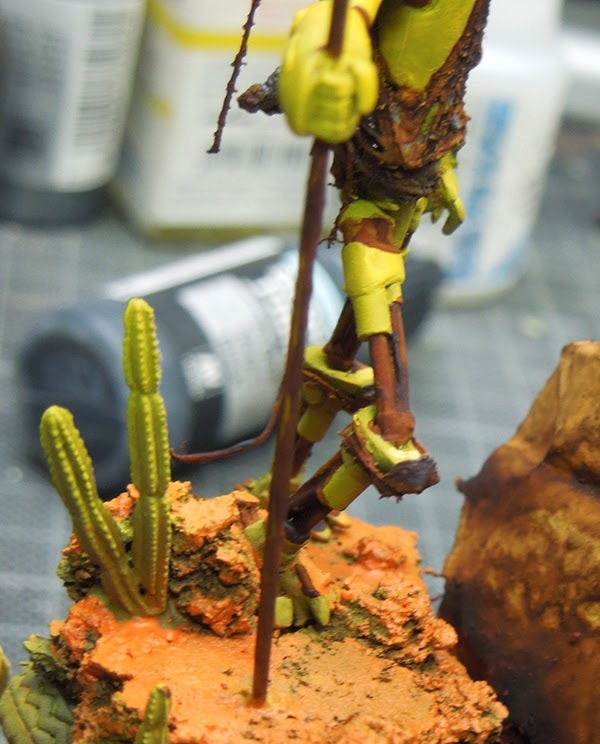 I did not take yellow to put it on the figure with my airbrush. Why? 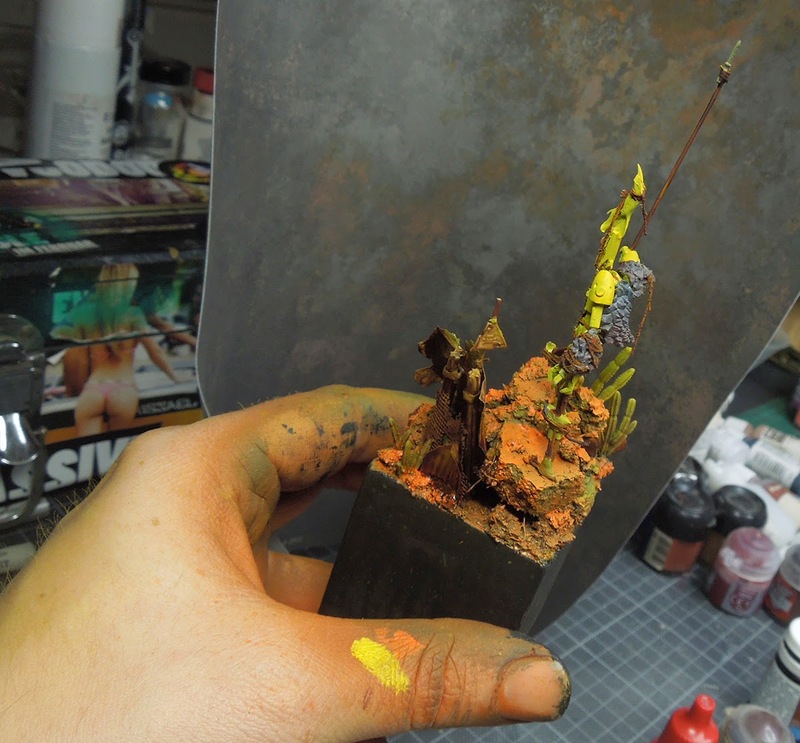 Yellow is a strange colour to paint with and I wanted to have a stronger basecoat beneath it. 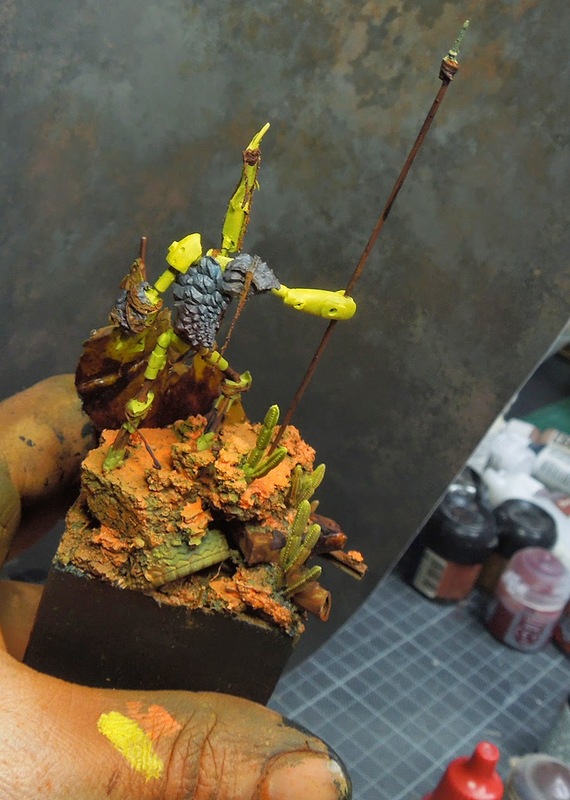 So before I head for yellow I used a mix from green and grey. From now on your should also check my fingers on the photos to see how the colour that I used looked like ... PFFFT! I liked the green touch in it but I wanted to reach yellow someday. 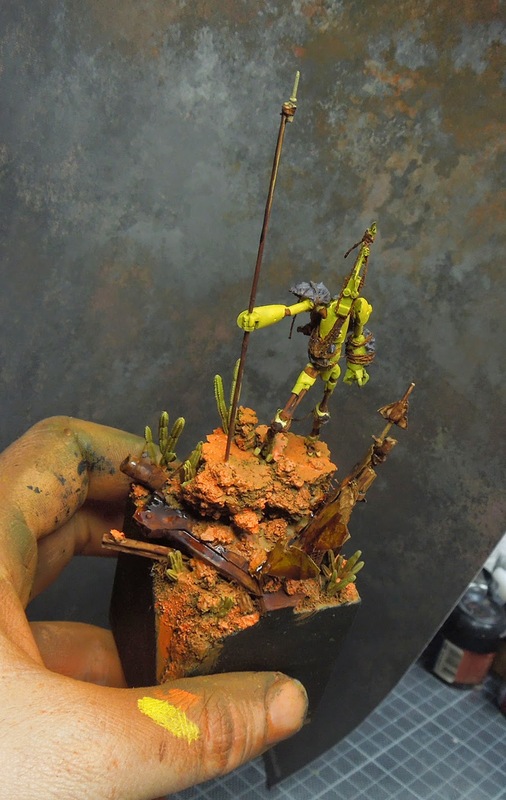 So I took a bright green and mixed a drop of yellow into it to approach my yellow goal like a tripping ninja ... even I did hit the base with that colour at the moment I listen to the voices that said "it doesn't matter right now" .... PFFFT! ... but painted my plinth black in this stage. I wanted to get this orange back in sight. I was pretty influanced by orange as Sanne, our traine was painting at a big cool canvas these days and used strong power- and colourful moves with orange. 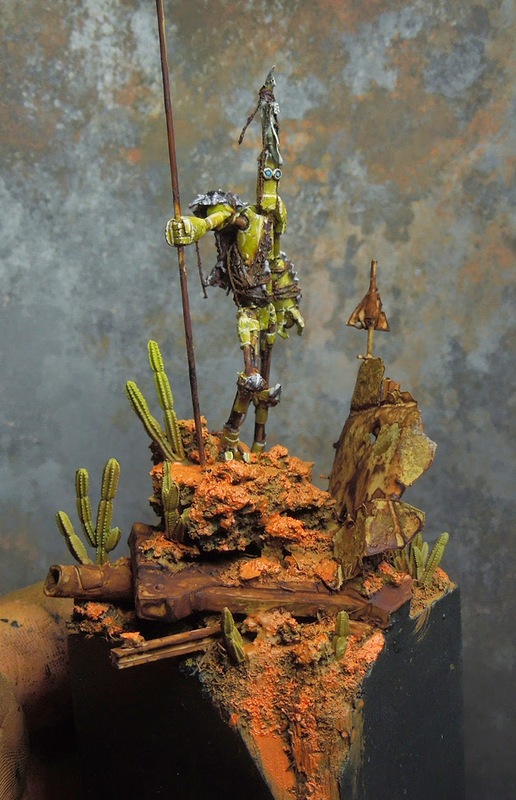 So I took a brush now to bring back that orange brown ... As you can see I left the cacti, metal parts and robot green still. CHOCK! CHOCK! 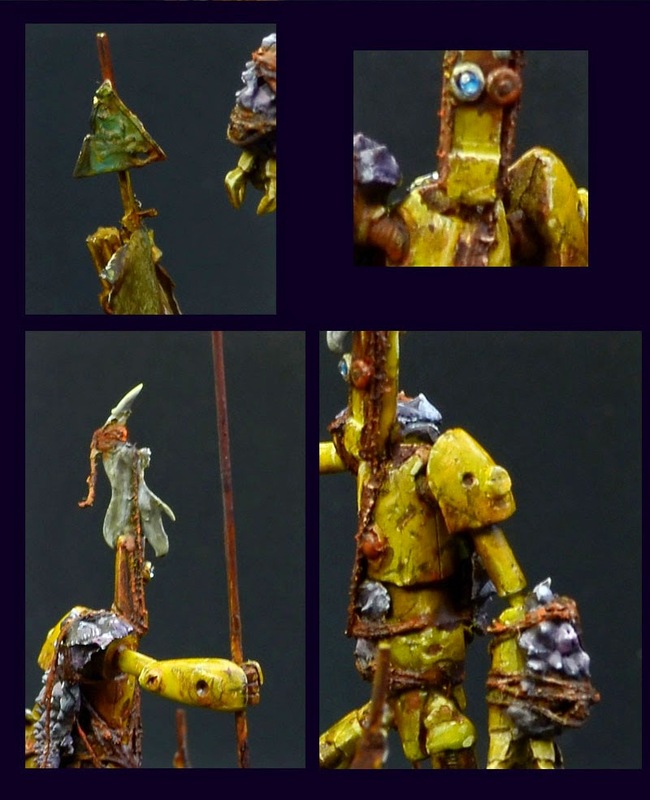 Yellow was the colour I was aiming for so using yellow glazes with a brush I brought in more yellow to the robot's body. 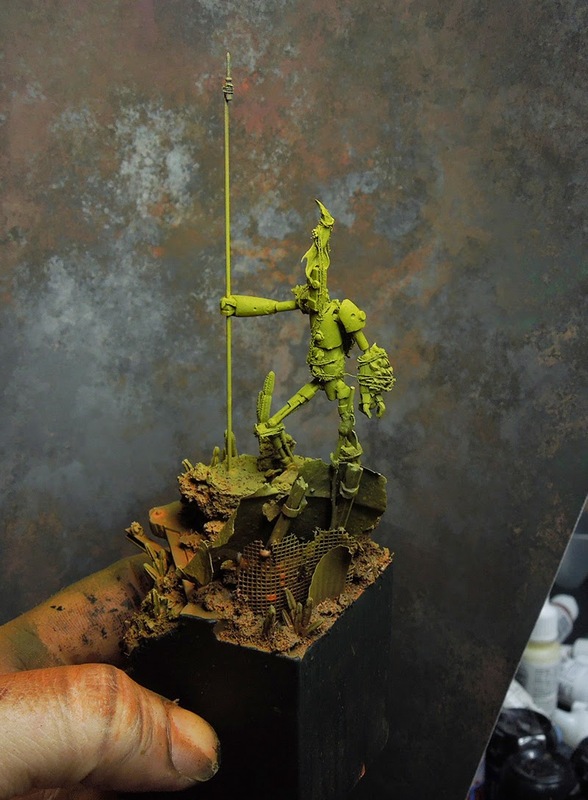 Mainly using the theory of zenithal light here to know where to put it. 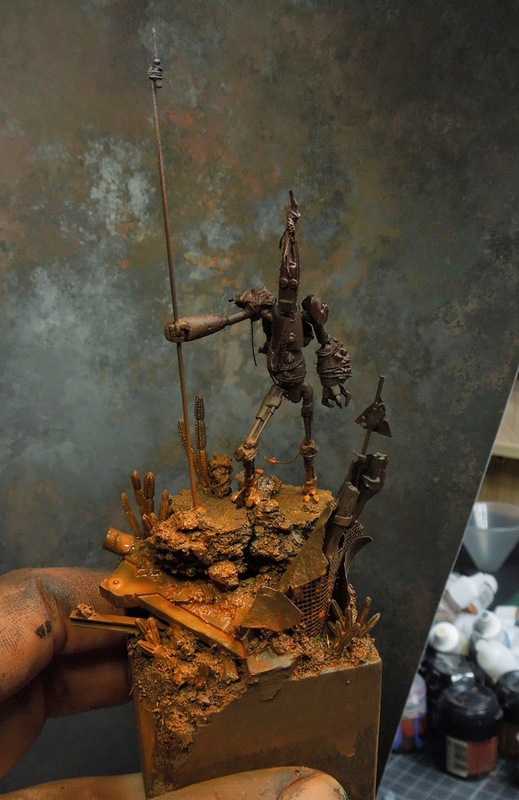 Well, while my wild rust effect applyment needed time to dry here and there I used some dark grey, which was mixed from black/white/touch of purple in it and applied it to the monster-skin parts. On the back cloak part you might recognize that the purple is getting more the lower you look. Happened out of the belly but I liked that. Just did put more purple in my basic mix here and threw it carefully at place with a brush. Did the same with a little more white to the grey mix in the upper parts to sketch the overall light situation of the pieces ... PLOW! 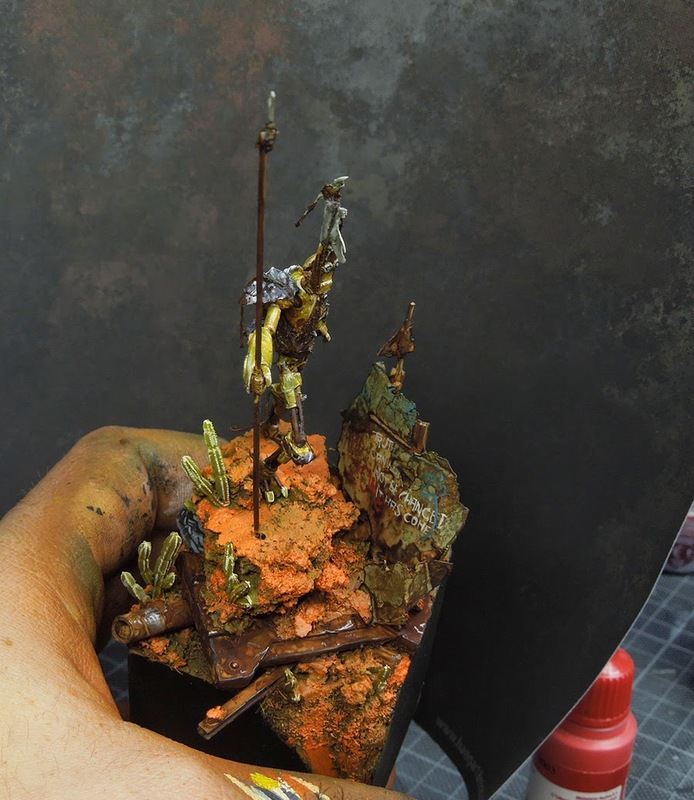 More rust effect was applied to achieve a more interesting and varying surface. Closing the picture even more I decided to put some greenish grey to the bone part on his head, also sketching in some bright and dark areas. 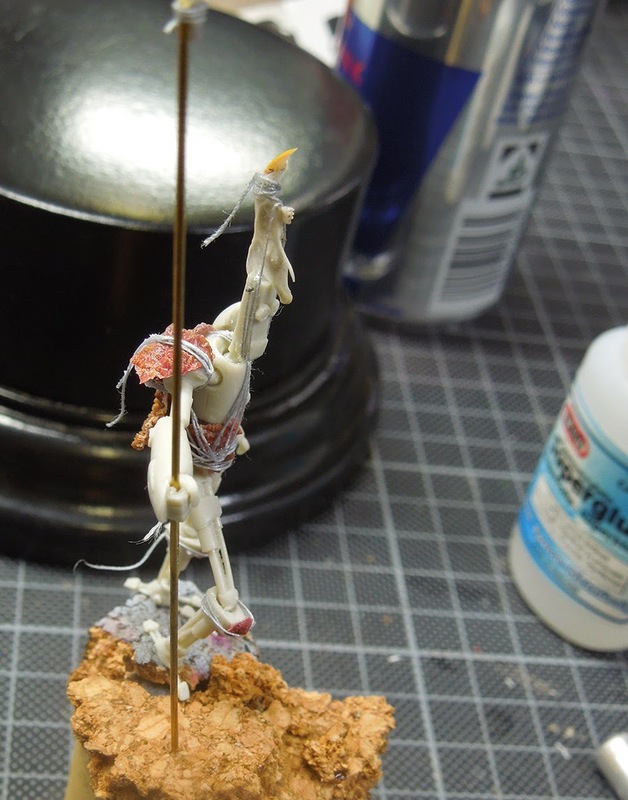 I started to add more light and dark spots to the monster skin areas. I also made a gentle start into weathering the yellow parts of the robot, by using a good brush with a good tip to add random scratches to the yellow paint. Not completly random as I tried to think while doing so. I thought where would colour chip off and why. but with a quick glane I knew they would not stay that way. Too much orange all around. Again I went for the eyes and painted them blue as this is a good contrast colour to all that orange. 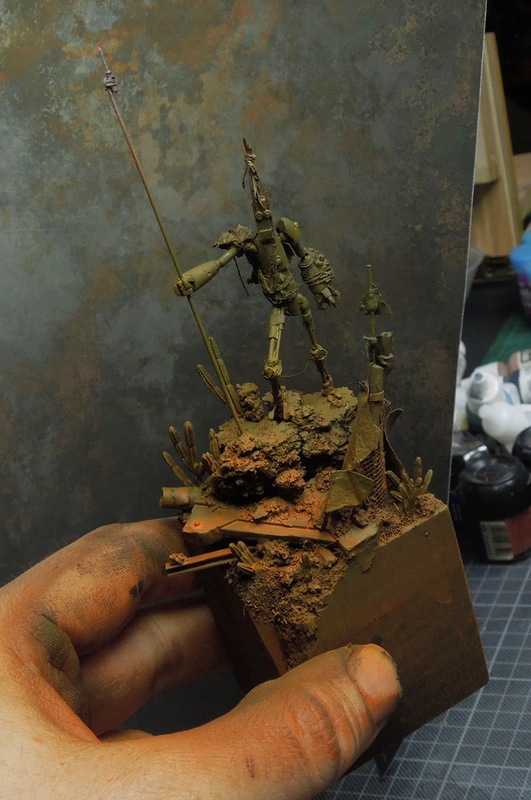 Again I went for the scratches and the weathering with a brighter tone. Using the greenish yellow tone plus some little amount of white to it to paint edge highlights on all those scratches and damaged details. This looks rough at the moment but that is what I wanted. A contrast that you can easily spot. See the same thoughts explained in this article about true material damage. 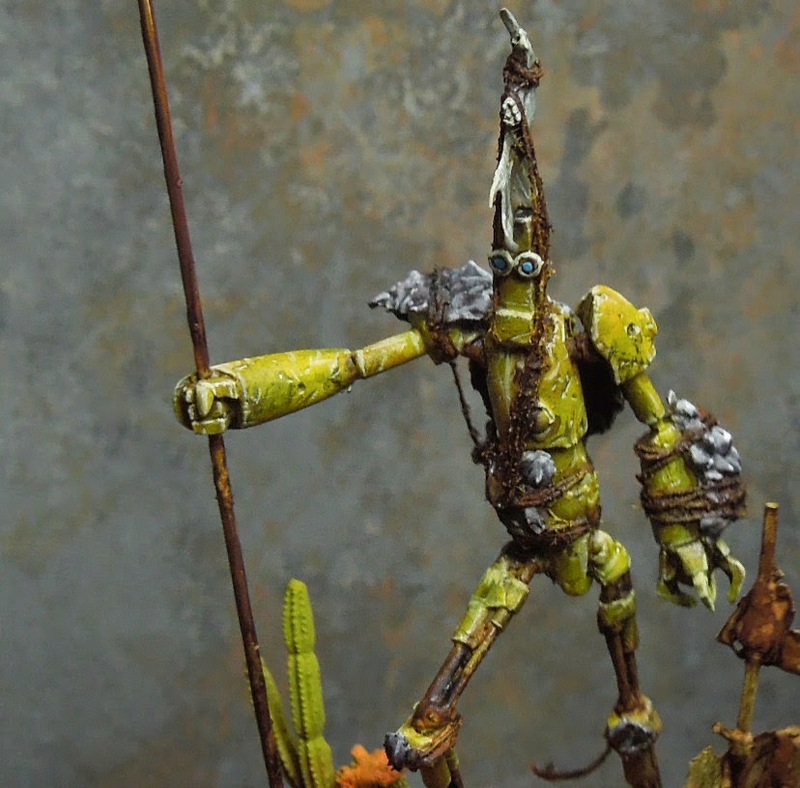 I used some dark brown glazes with a drop of yellow in it to paint shadows to the body parts of the robot. Why the yellow? Well, gently going darker, if I would just use dark brown it would look too dirty first. With the yellow in the mix I can slowly get a feeling for what I am doing there and slowly increase the contrast, going darker. 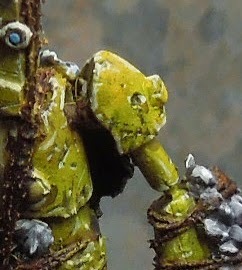 With the initial glazes I also reworked on too strong highlights in the damage parts, making them soft again. 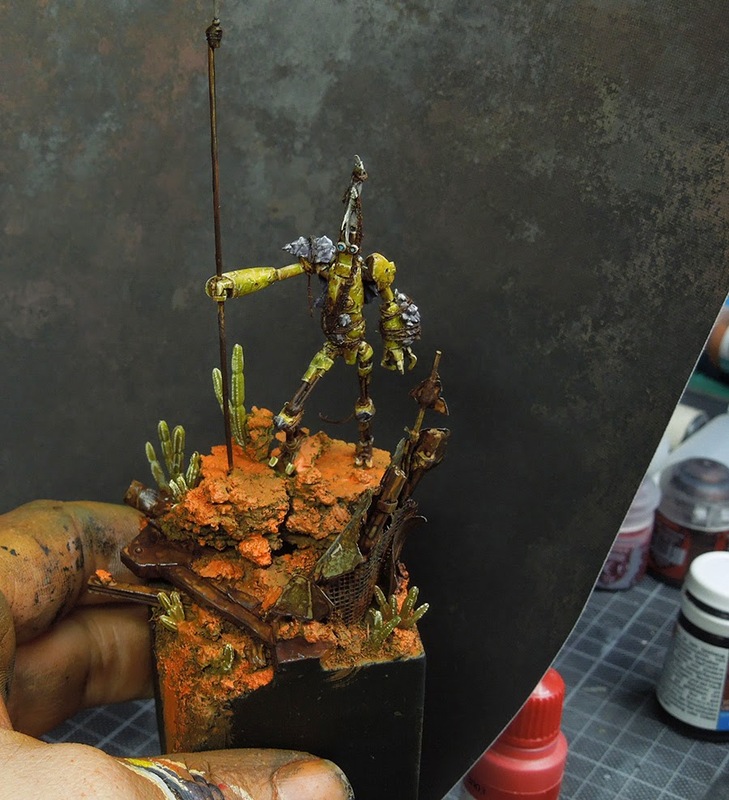 The same dark brown glazes (without yellow) were used on the rust parts to increase the contrast. I used more white in my edge-highlight-mix to paint some stronger edge highlights to the upper parts of the robot (remember zenithal light). 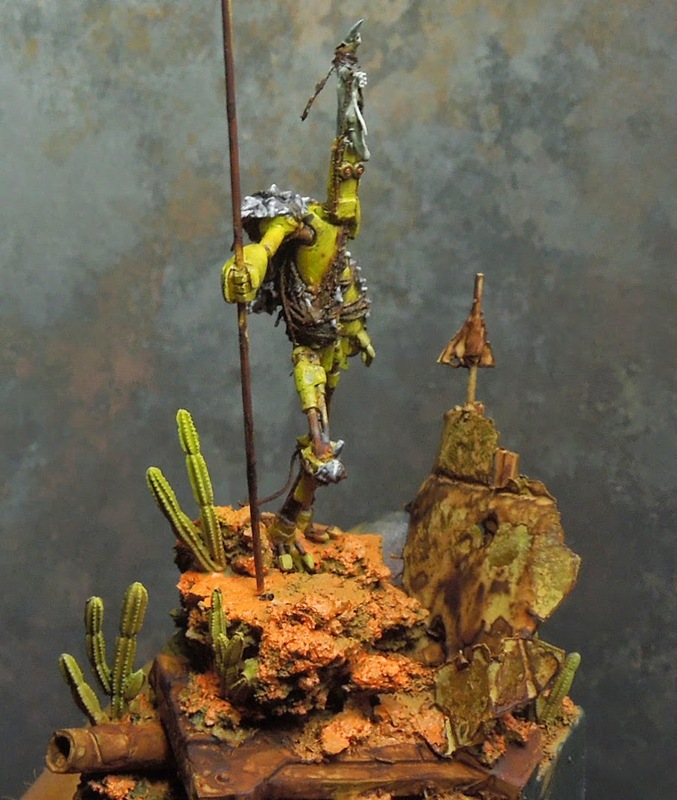 I used that tone on the bone parts, monster-skin and cacti too to bring in that overall light situation. As I still had some blue left on wet palette I decided to go with soft grafitis on that rust piece and also changed the colour here and there with a thin glaze of blue. I wrote the little sentence "Truth can not be changed, it has come!" to the grafiti area as this felt just right for this wasteland/fallout environment. 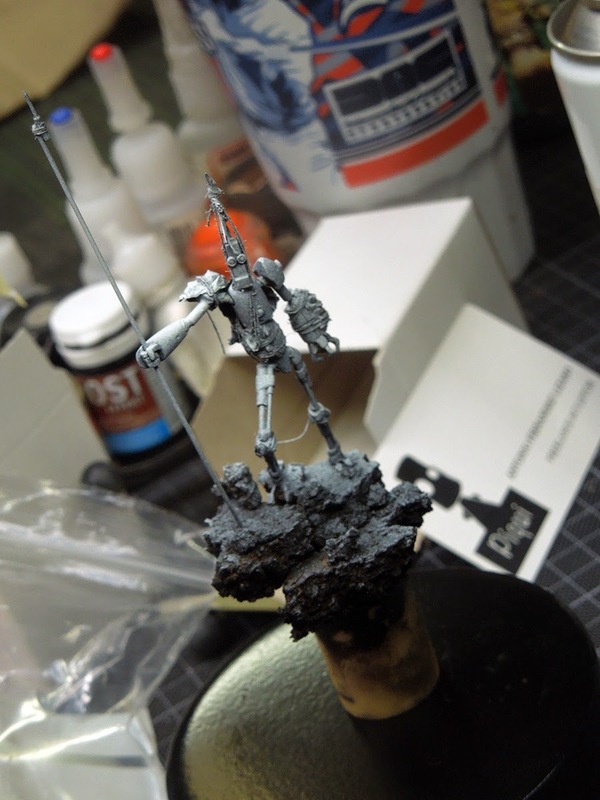 A dark silver was used to bring on some edge highlights to the metal parts here and there. Now back to the base. I missed contrast on the orange there too and went brighter in the areas that were directly hit by the zenithal light. BOOM! BOOM! CHACK! 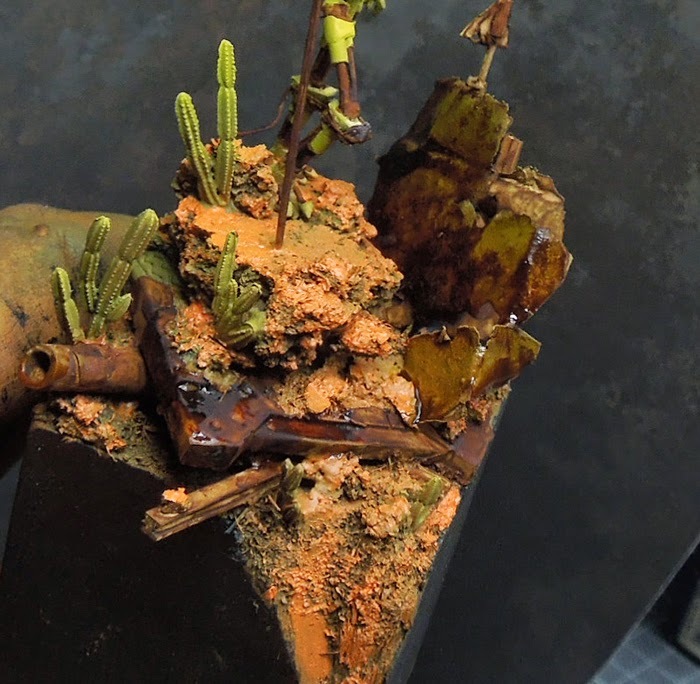 For the big amount of final steps I started to work on the rust parts on the whole situation. Adding a little brighter detail here and there or even using more orange acyrlic colour to place it here and there to make the areas more interesting. 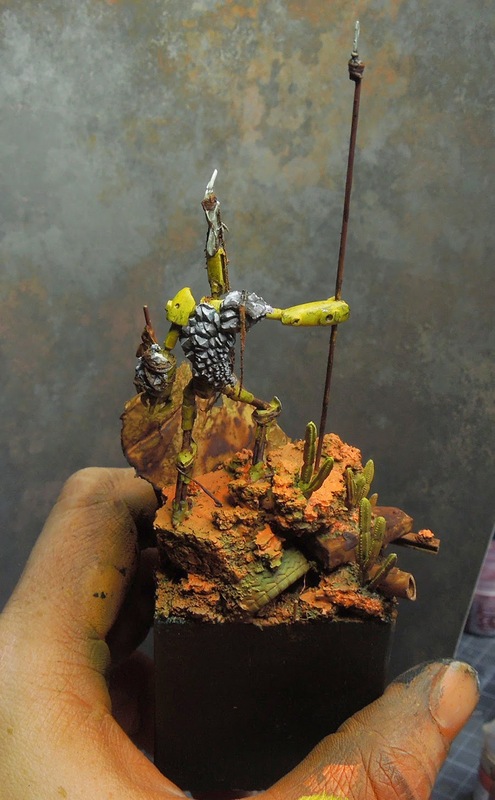 Pure yellow was used as a thin glaze over the armour parts that face the light to bring back the yellow I wanted there to be. 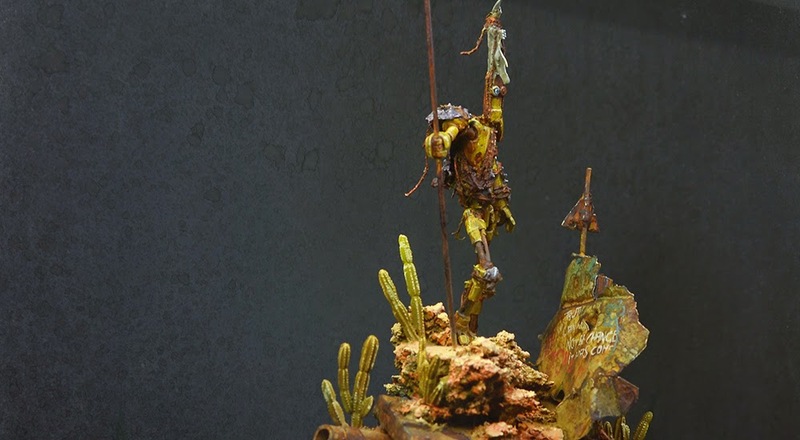 Same was done to the cacti's upper parts, they went too white during the progress so a glaze from yellow/green was put on top of the upper areas. 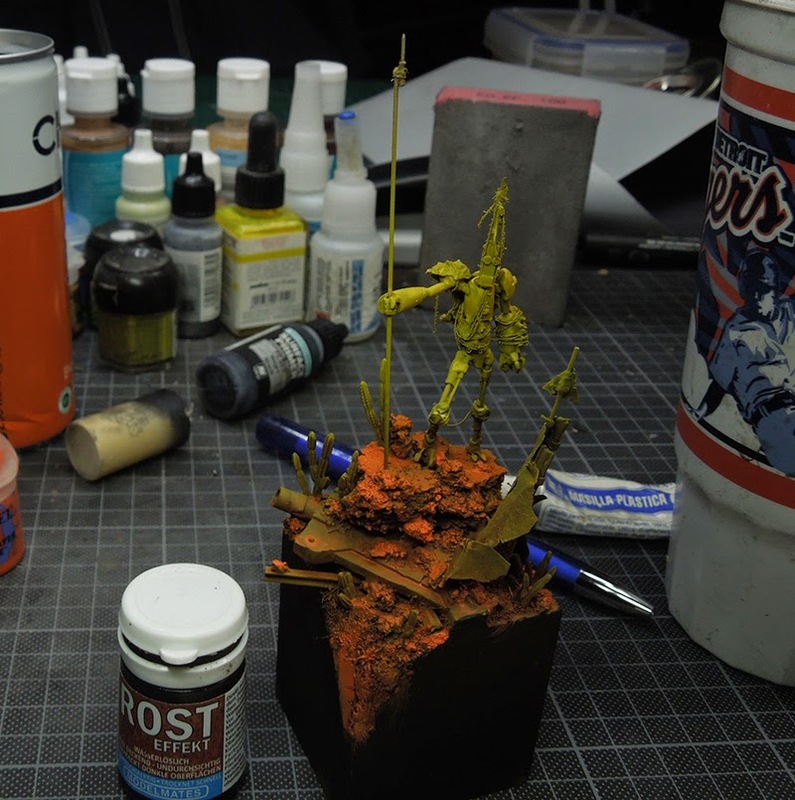 Then I used brownish/orange pigments for the whole base, even placed some here and there on the robots rust areas. 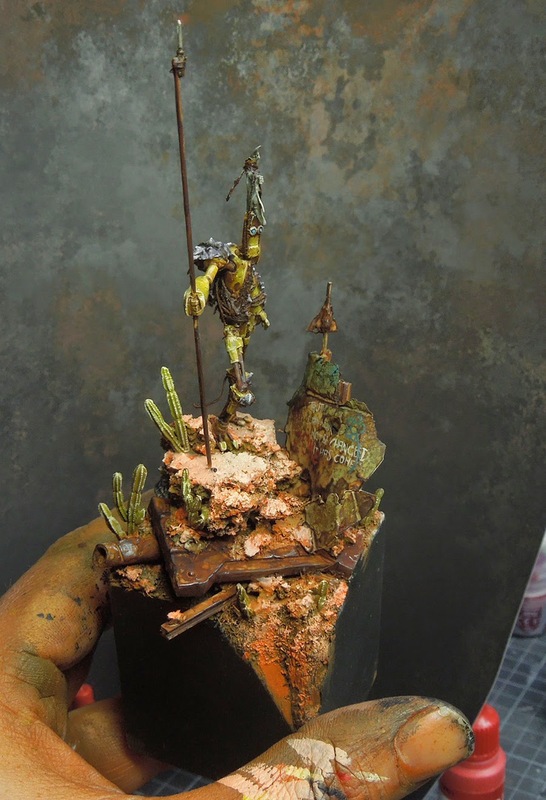 This helped me to bring the base together, the dry pigment dust blends it all together nicely. Real lenticulars were used on one of his eyes, on top of the blue while I decided to make the other one dead and rusted. Checked for some detail clean ups here and there, painted the socket black once more and was happy how "the First One" came to life. Now I talked about much but did not mention only cacti, eh? What about the announced robot oil and desert animals? Well, this robot surely needs some robot oil soon and desert animals have all been eaten by the evil monsters. Really funny project to work on and I am really happy to see this as a prize in the actual contest. I am looking forward to make one of you happy with this figure. 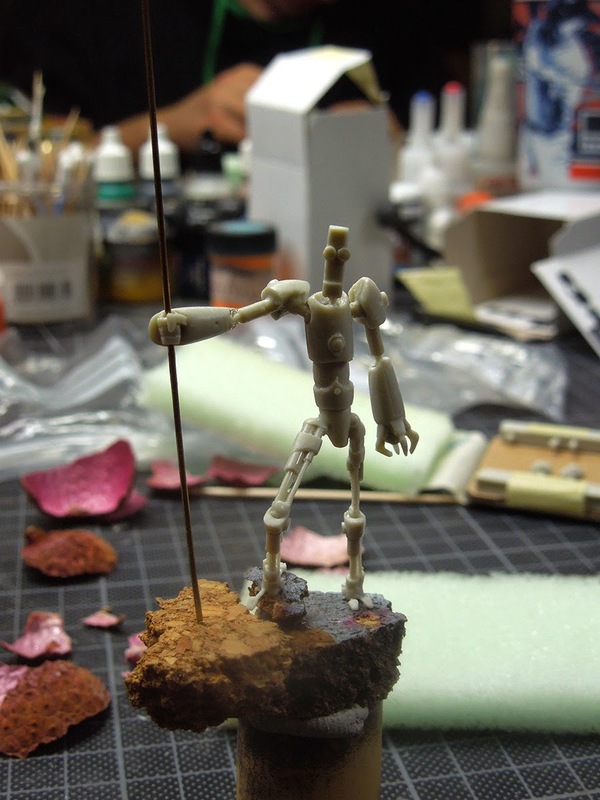 Check the contest "Forged Hope" to become part of it and build up your own robot. I hope this article could provide help here and there, but don't you worry, you don't have to paint the way I do. Paint it your way! If any questions about the content of the article might appear, please drop them via comment. I am happy to answer you as soon as possible. If you enjoyed reading the step by step feel invited to drop a little support via jungle donation. Thanks to those who did and still do once in a while. 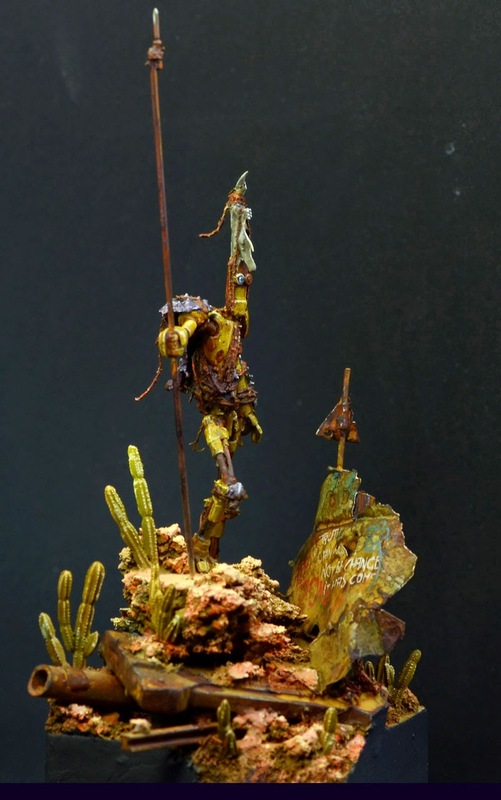 Thx once more ,for an awesome article, I already ordered the miniature and can`t wait to start . 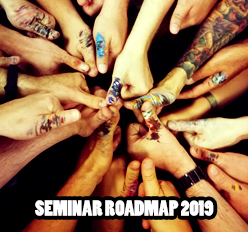 Spend a lot of time in the car the last days(and a lot of money in Berlin at Battlefield Berlin :-) ) and had a lot of time to think about what kind of support the forge father invented.The contest is such a great idea and all the work you guys put into it, to make it an alive story . Wow, one fanstastic piece of work, truly! It reminds me of Klaymen character from Neverhood, i think it's because of the eyes :) Where do you get this type of cork? (shown here and in one of your tutorials). i am not able to find these in my area, just some thin ones. Looking forward to your entry, this sounds you are making your thoughts! Very cool! Thank you! Really happy that you like it! I bought the thin cork at PK-Pro. Ordered mine yesterday and can,t wait to start mine! One Question where you got that thin string from?? Thank you! The string is twine for sewing.